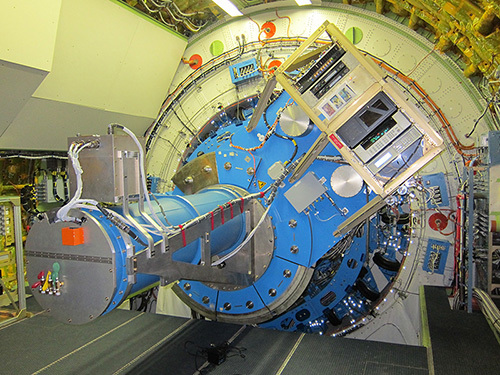 The Echelon-Cross- Echelle Spectrograph (EXES) is a Principal Investigator class Science Instrument. EXES operates in the 4.5 – 28.3 μm wavelength region, at high (R ≈ 50,000 – 100,000), medium (R ≈ 5000 – 20,000) and low (R ≈ 1000 – 3000) spectral resolution. The instrument uses a 1024x1024 Si:As detector array. High resolution is provided by an echelon—a coarsely-ruled, steeply-blazed aluminum reflection grating—along with an echelle grating to cross-disperse the spectrum. The echelon can be bypassed so that the echelle acts as the sole dispersive element. This results in single order spectra at medium or low resolution depending on the incident angle. Information applicable to the current observing cycle, Cycle 6, can be found in the EXES chapter of the Cycle 6 Observer's Handbook. Those submitting proposals for Cycle 7 must refer to the EXES chapter of the Cycle 7 Observer's Handbook. Be sure that you are referencing the correct version of the handbook!